These Roasted Garlic Butter Mushrooms are perfect for an appetizer, a side dish, a meat substitute, or your cheese board! When it seems like your cheese board could use a little jazzing up, go for something with more substance! Looking for a quick and easy side dish that isn’t green beans or peas, or a dreaded carb like pasta or rice? Check out these easy roasted garlic butter mushrooms. Now you know that I don’t usually post side dishes as we are all about appetizers, tapas, and party foods here at Take Two Tapas, but this recipe is so versatile that you can use them for a party! 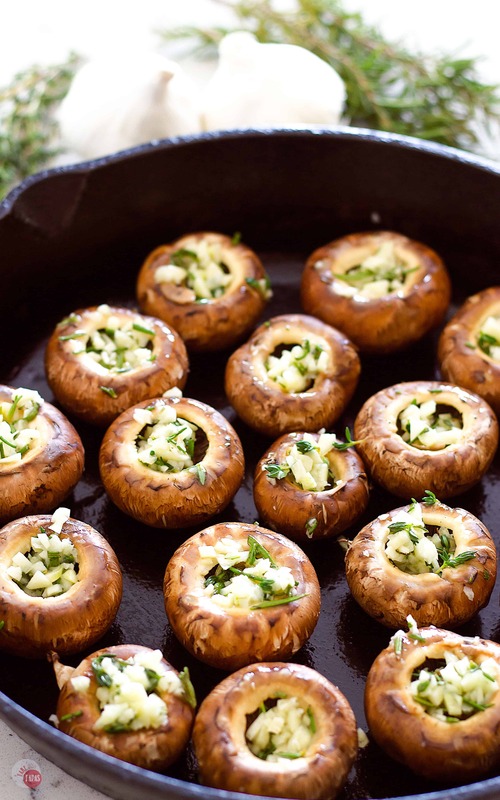 These Garlic Butter Mushrooms make a great appetizer to bring to a party! People love stuffed mushrooms, don’t they? 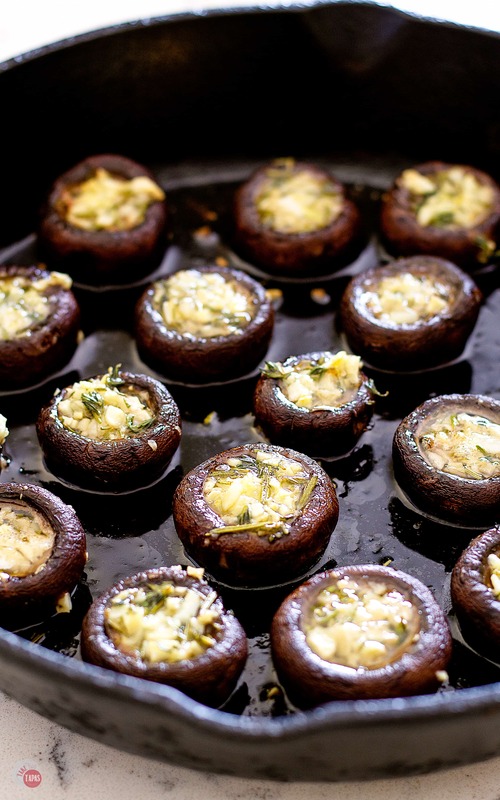 While they might not seem like your traditional stuffed mushroom, you can serve them as such. But you can also use them as an addition to a cheese board, as an afternoon snack, or as the start of an afternoon grazing on small plates! Just take me to the Roasted Garlic Butter Mushrooms Recipe Already! If you’d rather skip my (very helpful, I think) tips and tricks, essential cooking info, and similar recipe ideas – and get straight to this delicious easy Roasted Garlic Butter Mushrooms recipe – simply scroll to the bottom of the page where you can find the printable recipe card. 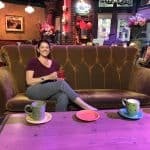 If you’ve been reading this blog for a while, you know that I have a hate-hate relationship with mushrooms. I only make them because I know my family likes them. And yes, before you get all preachy with your “mushrooms are awesome you must have this feeling from long ago” or “you haven’t had a good mushroom so you can’t say that” attitude, I will stop you right there. I have tried mushrooms recently. As recently as cooking this recipe! I try mushrooms, prepared in various ways, at least every other year to see if my feelings toward them have changed with age. This has happened with other foods, so I don’t give up on them. Maybe I will actually start liking them when I’m 100. My personal feelings and taste buds aside, mushrooms are a very popular food and they make great appetizers. Just look at my Magnificent Stuffed Mushrooms, and my Yuck Bruschetta Spread! Both are loved by my family but not by me. But I am here for you guys and not just myself. So I have parlayed these roasted garlic butter mushrooms into an appetizer that you can also use to put on your cheese board or relish tray! 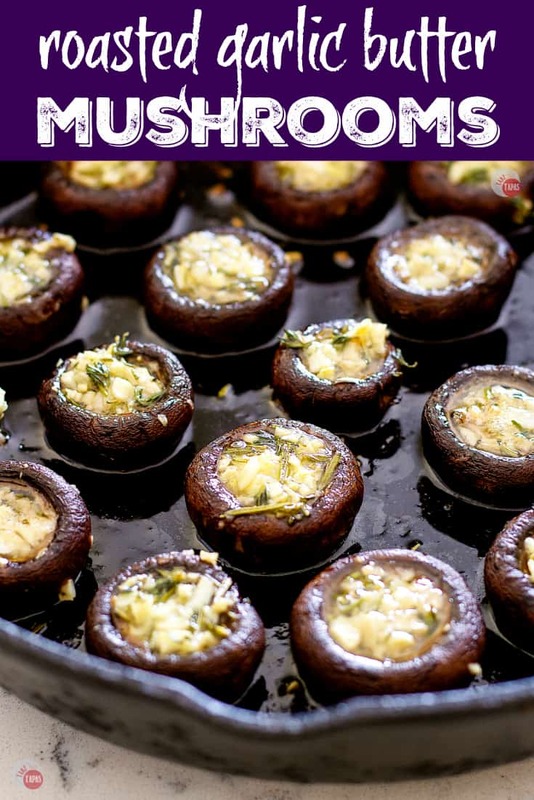 These Garlic Butter Mushrooms are super easy to put together and you can have them in the oven in less than 5 minutes! The melted butter, garlic, and fresh herb mixture pairs perfectly with the Earthiness of the mushrooms but you can also use it for pasta, rice, chicken, or on a hunk of crusty French bread! Start by grabbing a cast iron skillet or other oven-proof dish or pan. Preheat your oven to 400F and gather the few ingredients you need. Fresh garlic or pre-minced garlic in the jar works well for this recipe. Add it to your melted butter, and roughly chop some fresh herbs to go in it too. Using this herb stripper to get the leaves off the stems is a time saver! I like to make this mixture ahead of time and let the garlic and herbs infuse the melted butter a little more. You can just reheat it when you are ready to go! Clean your mushrooms with a damp cloth and remove the stems. Don’t throw them away as they make a great addition to vegetable stock or burgers! 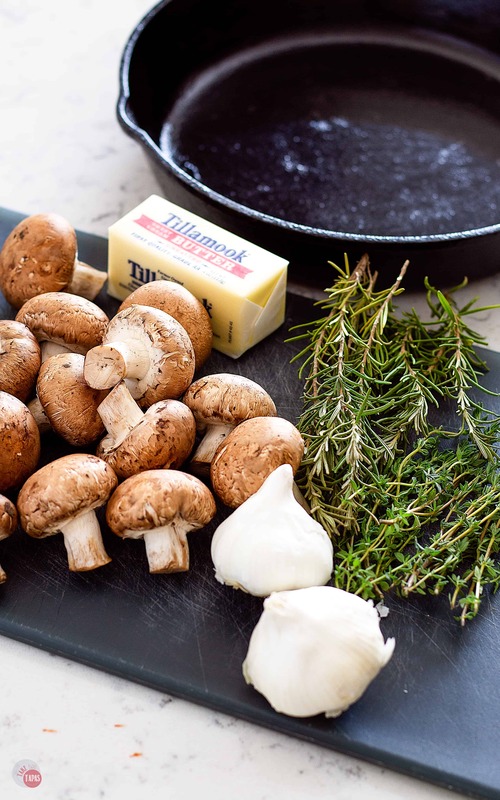 Place the mushrooms in your pan (or baking dish) and brush them with the melted butter. Spoon the garlic and herbs into the caps until they are all full and the garlic and herbs are all used. If there is any remaining melted butter, drizzle it over the mushrooms. Pop the pan in the oven and roast for 15 minutes or until the garlic and herbs are smelling delicious and the mushrooms are a nice dark brown. Remove the pan from the oven and let the mushrooms cool for a few minutes. Transfer the roasted garlic butter mushrooms to a serving dish, bowl for your cheese board, or another container, and enjoy! Q: Can cooked mushrooms be frozen? A: Yes you can. Raw mushrooms do not freeze as well as cooked mushrooms. Just be sure to let them cool and store in an air-tight container/bag in the freezer for up to a month. Q: Can these be made ahead of time and reheated? A: You can reheat these garlic butter mushrooms if they have been stored in the refrigerator for no longer than 24 hours. When reheating them, reheat in the oven at 175F until warm. Q: How long will these garlic butter mushrooms last at room temperature? A: Not longer than 2 hours for safety reasons. Q: What is the best way to freeze the Roasted Garlic Butter Mushrooms? A: Place cooked mushrooms on a foil or parchment-lined baking sheet. Space the mushrooms evenly, without touching, on the sheet and place in the freezer. Freeze for two hours and then remove and store in a freezer container until ready to use. These roasted garlic butter mushrooms have so many opportunities to show up at your house! As a delicious veggie side dish, a rich and flavorful appetizer, tossed in a pasta or rice dish for a “meatless” meal, or as a surprising addition to your cheese board or antipasto platter! Whatever occasion you choose to serve these, they will be a hit! Other great Roasted Mushroom recipes to try! If you love this Roasted Garlic Butter Mushrooms Recipe as much as I do, please write a five-star review in the comment section below (or on Pinterest with the “tried it” button – you can now add pictures into reviews, too! ), and be sure to help me share on facebook! Looking for other great items to add to your cheese board? Check out these! These Roasted Garlic Butter Mushrooms are perfect for an appetizer, a side dish, a meat substitute, or your cheese board! Take a damp cloth or paper towel and gently clean off the mushrooms. 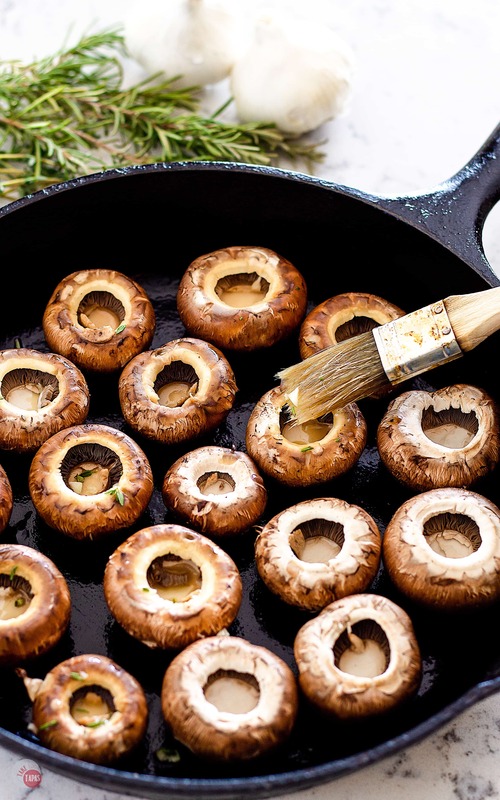 Place the mushroom caps in a cast iron skillet or foil-lined baking sheet. In a small bowl combine the melted butter, garlic, thyme, and rosemary. Brush or spoon just a little of the butter over each mushroom cap. Spoon the garlic and herbs evenly into each mushroom cap. Brush or drizzle the remaining butter over the mushroom caps. Bake the mushrooms at 400F for 15 minutes. Remove the mushrooms when they are browned and the garlic and herbs are fragrant and bubbly. Remove from the oven and cool for a few minutes. Eat as an appetizer, side dish, or as a great addition to your cheese board. This recipe was inspired but this one here. What an awesome appetizer idea! I need to give these a try for my next party! These beautiful mushrooms are in my opinion the perfect appetizer. You can bet I will be making them! I love mushrooms and this recipe is not only delicious but also very easy to make.This is one I will be making over and over again! 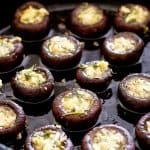 I love mushrooms stuffed with just about anything and your recipe here is a great reminder of just how good simple can be; I’m pinning this one for later! We’re having cocktails this evening and I wanted to serve something easy and warm! These totally fit that, the garlic butter will be so delicious on those earthy mushrooms! Talk about PERFECT timing!! I just took out a package of mushrooms with no plan and now I come across this recipe! It looks amazing and I will be making these tonight! YAY! Great appetizer, I love to eat mushrooms, Mushrooms you do very attractive. I love this recipe! Mushrooms are one of my favorite – great meaty texture while being vegetarian! And that little herb stripper is so cool! I looked for a link in the post to that so I could buy one, but I didn’t see one. Did I miss it?